The Argyle jacket is arguably the most versatile kilt jacket available on the market today. If you are a little unsure as to which jacket to buy, assuming you only want to buy one, then the Argyle is probably your best bet. The reason I say that is unlike the Prince Charlie (which is for evening and formal wear), the Argyle depending how you wear it can be used for semi-formal or casual wear. There is even one Argyle jacket in black wool, which when worn with a waistcoat (vest) and a black bow tie, is suitable for most formal occasions that you wish to attend. 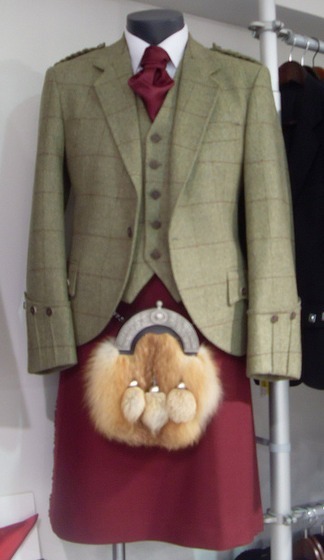 There is one important point to remember when choosing a kilt jacket, and that is with the Prince Charlie the matching waistcoat is included in the price. Whereas with the Argyle, the matching waistcoat would have to be bought as a separate item. 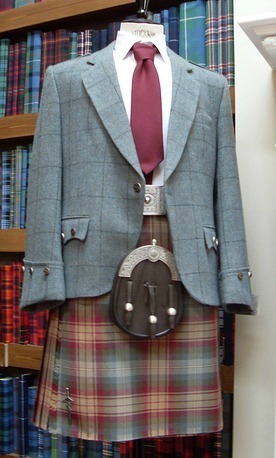 Below you can see a stunning example of the jacket, being shown with a beautiful self coloured kilt. You can of course also wear a contrasting coloured waistcoat, which then gives the jacket a more casual look. I have also often seen people wear a tartan waistcoat which matches the tartan of their kilt, and this helps to add to the versatility of the jacket. I would like to point out here that when wearing a waistcoat with your kilt jacket you should not wear your kilt belt, I have unfortunately seen to many photos on the net where people are doing just that, the belt spoils the lie of the waistcoat. 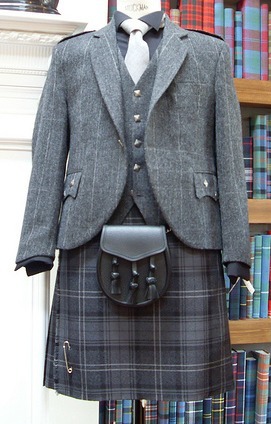 For the most casual look the jacket would be worn without a waistcoat, such a look is for example often seen at Highland Games around the world. You can see the jacket being worn without the waistcoat, in the next photo. Another interesting feature of the Argyle jacket is the way you can choose different finishes to the cuffs. There are basically three to choose from, the first which is a gauntlet cuff is often referred to as an "Argyll", the next a three buttoned patch cuff (also commonly found on the Prince Charlie jacket), is called a "Braemar", the last one which is referred to as a "Crail" cuff, is plain with a single button. One point of caution here, not all manufacturers use these names (although most do) so do talk to your kilt maker before deciding on which cuffs you want for your jacket. And if buying online be sure you have seen a photo of the jacket first, paying particular attention to the cuffs. The jacket as I mentioned earlier can also be worn with a matching or contrasting waistcoat (vest), this is usually done when attending a semi-formal occassion, and you can see a photo below. To avoid any confusion, it is worth noting that this jacket is also known as the Argyll jacket it is the same jacket, simply a different spelling. These jackets are available in a wide choice of colours, as a general guide darker blues or greens are more suitable for semi-formal, whereas lighter colours or perhaps Harris Tweed tend to be worn more for casual day wear. But as I have said many times before, these are only guides, and you should decide which jacket you like best and go with that, after all who knows what suits you best better than you? As always if you have any questions regarding this page, or anything else to do with your kilt outfit. please drop me a line using the "Contact Us" page.